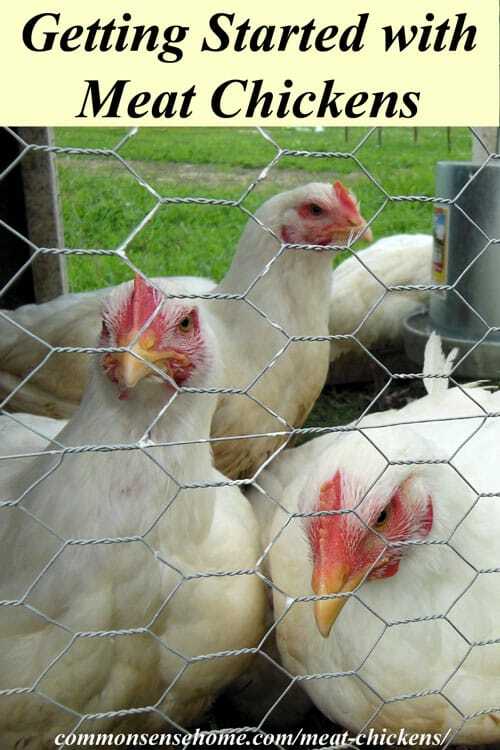 Homestead chickens are a great small scale protein option for meat or eggs, and don't require a huge investment in time or materials to get started. 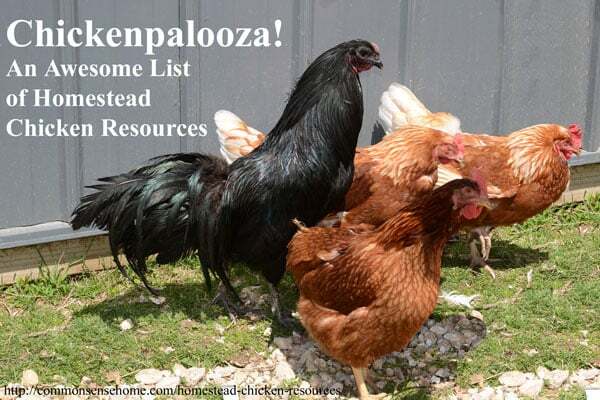 I've teamed up with a number of my blogging friends to pull together this awesome list of homestead chicken resources to help you with everything from hatching your own eggs to predator patrol and chicken diapers (yes, they exist). 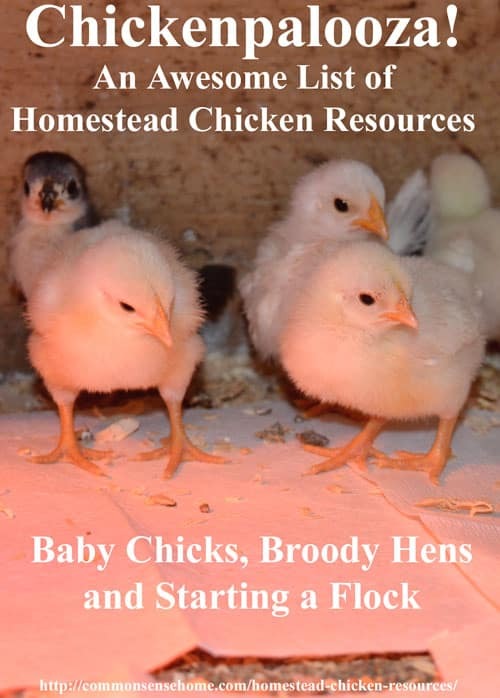 There's information on coops and runs, feeds and foraging, roosters and broody hens. We also include plenty of posts about the “why” as well as the “how” of raising chickens, as well as the tough stuff like dealing with sick chickens and harvesting chickens for meat. If you have a topic that's not covered, please ask, as I'm sure someone in the group has a post that can help. Enjoy! There are around a bazillion chicken books out there, but I wanted to highlight a few that I have in my personal collection. This is a quick and easy introduction to the basics of chicken raising. Covers everything bringing your chicks safely home to general flock management, with troubleshooting tips for the basic stuff that runs flocks “a-fowl”. A great starter chicken book. As would be expected from a book by Murray McMurray, there's lots of “chicken eye candy” in this one. 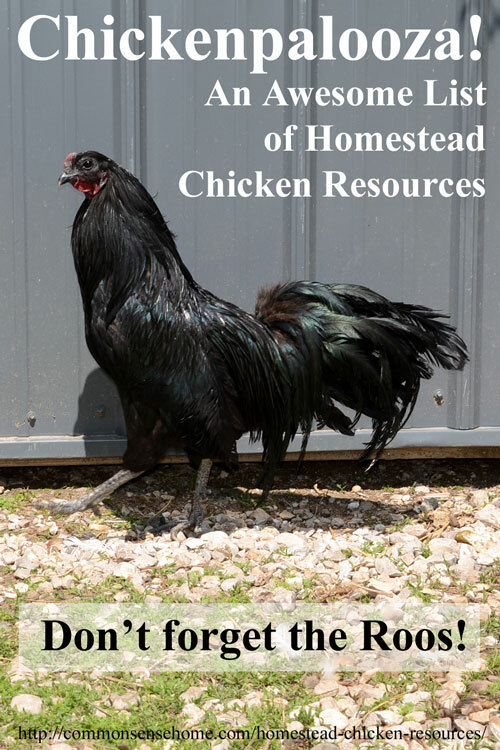 Filled with photos and helpful illustrations, this book is a great pep talk for anyone considering chicken ownership. My favorite parts – 10 pages of breed profiles with photos near the end of the book, and the double page spread of coop illustrations. One of the classics of chicken care, this recently updated tome covers a wide and detailed spectrum of chicken information. 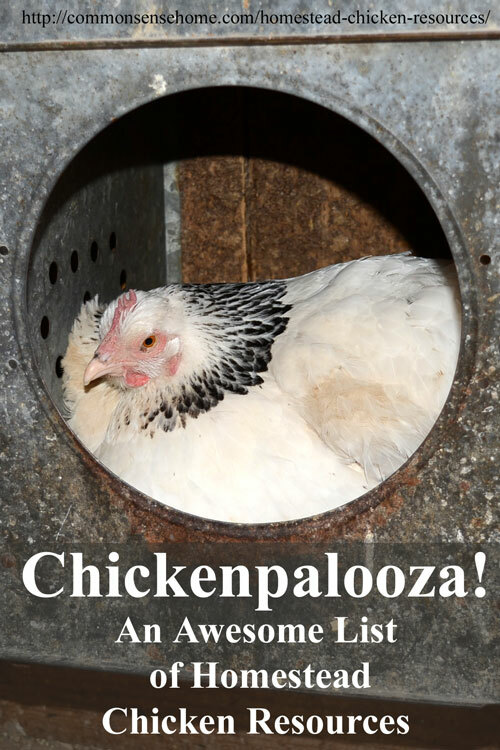 some less commonly covered topics include managing a breeder flock, which is important for those who truly wish to be self-reliant; and exhibiting your chickens, which can be a fun and rewarding hobby for the whole family. This book hails from Joel Salatin of Polyface Farms, the icon of small scale family farming that's good for the soil, the critters and the consumers. This book is built for function, not looks. the text looks like it was tapped out on a typewriter and the photos are black and white. That said, you can't argue with Mr. Salatin's success and his willingness to experiment to hammer out a system of rotational grazing that houses different species on the same pasture to the benefit of them all. The old Polyface Farm newsletters included in the appendix are like peeking into a time capsule. 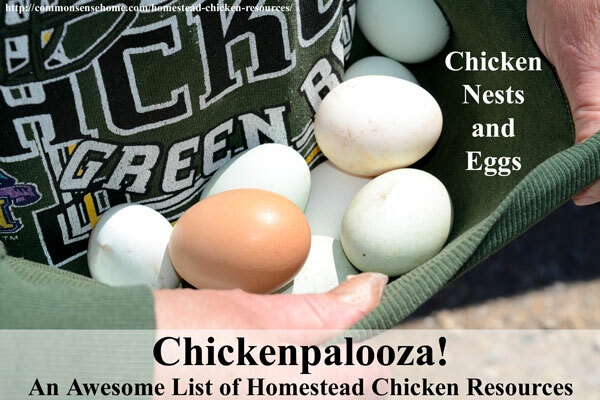 And finally, the Monster List of All Things Homestead Chicken from my site and many of my blogging friends. This has to be one of the most inclusive chicken posts ever put together! Wonderful job on this. And thank you for including my book with the other very well known and loved books. You’re welcome, and thank you for contributing posts and a copy of your book to review. I think the other books mentioned are great, but certain things can seem overwhelming for someone who just wants a small backyard flock, at least until you’ve been working with the birds a little more. 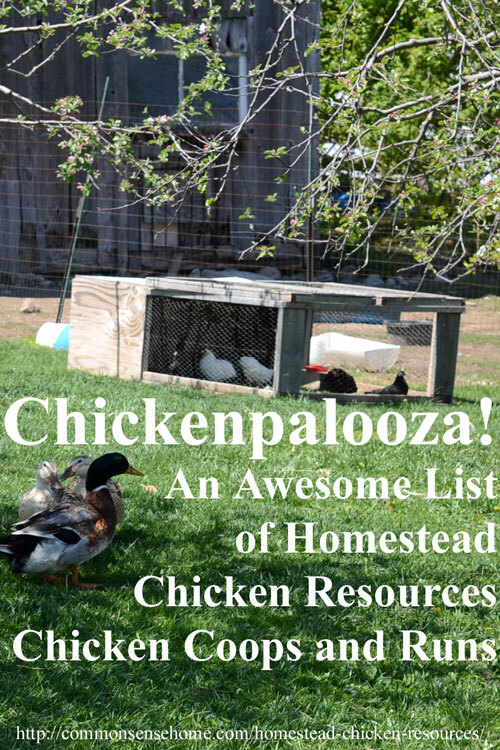 I just had someone the other day say, “I need a good blog post on getting started with chickens and all the things you can do with them.” I think this will certainly be thorough enough for her! Great site. Thanks! Does anyone know of a rooster breed that doesn’t crow much? (If there is such a thing?) We loved our rooster but had to get rid of him because we were afraid the neighbors would get upset. We’ve had white leg horns and buffs.